A Flash Media Server hosting service-based technology (with support for Live and On-Demand applications) designed specifically for your event spot. Events, special occasions, anniversaries, celebrations or any other "situation for event" that distribute images and emotions on the internet, find an ideal solution in the new service FMS Hosting Spot (S). Simply place the contents will be distributed on-demand, or the encoding station Live (thanks to SW free Adobe © Flash Media Live Encoder) and activate the service FMS Spot (S) for the expected duration of the event by one of the available profiles (in line with the assumptions of traffic / visitors expected) and go online on your site! The service FMS Hosting Spot (S) (like all services IdeaWeb.IT Hosting FMS), is in fact paid as a real support. 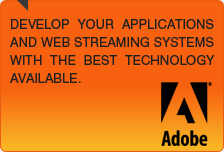 Once activated it will be able to provide all the functionality provided by Adobe Flash © Media Server to your application / s to be posted directly to your web space / site, in a very "transparent" to users, but very effective and usable, avoiding among other annoying and inelegant "jumps URL for the application / player for the distribution of content. In this way your website / domain will support only the web traffic and the weight load and connectivity of individual flows generated from disbursement will be supported by ns. Flash Media Server. The following table shows the report between user/connection bitrate and the maximun users available.